Our balloon rose quickly into the cool morning sky. Below, the field was still filled with large impossibly shaped balloons. One looked like a giant cow and another a giant baby. All around us the sky was filled with more and more hot air balloons. 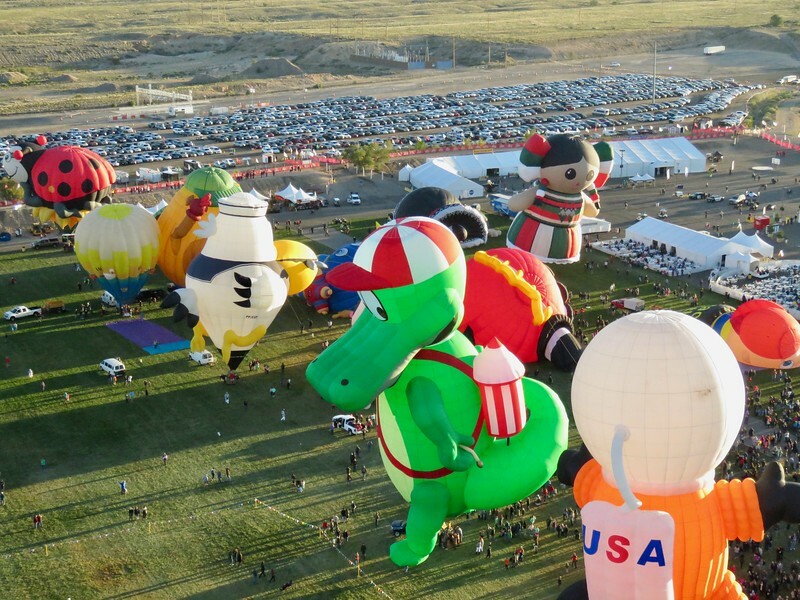 This was the Albuquerque International Balloon Fiesta and there was one less item on my bucket list. I had been talking to Visit Albuquerque and their PR representative for a few years about coming to the city. Neither my wife nor I had ever been to New Mexico. They suggested 4 different festivals that I might attend and one of them leapt from the screen as I read their emails. 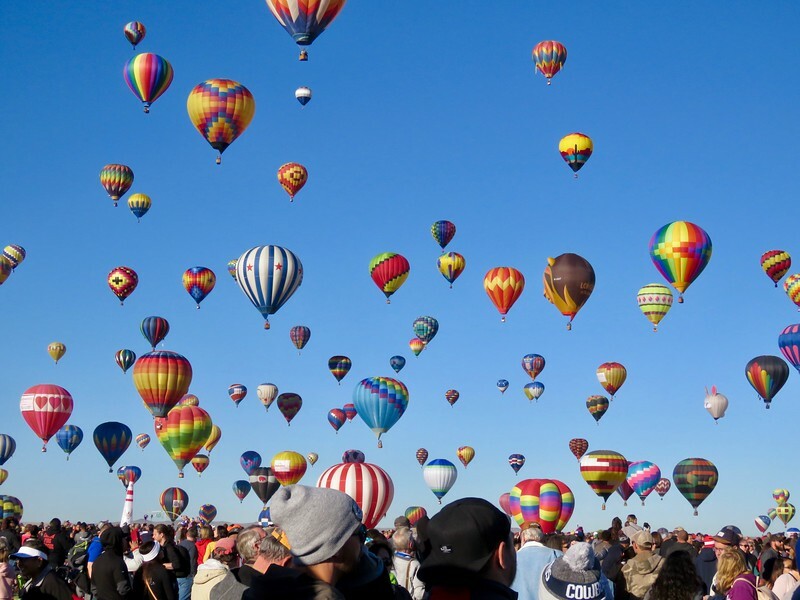 The Albuquerque Balloon Fiesta was quite literally on my bucket list. 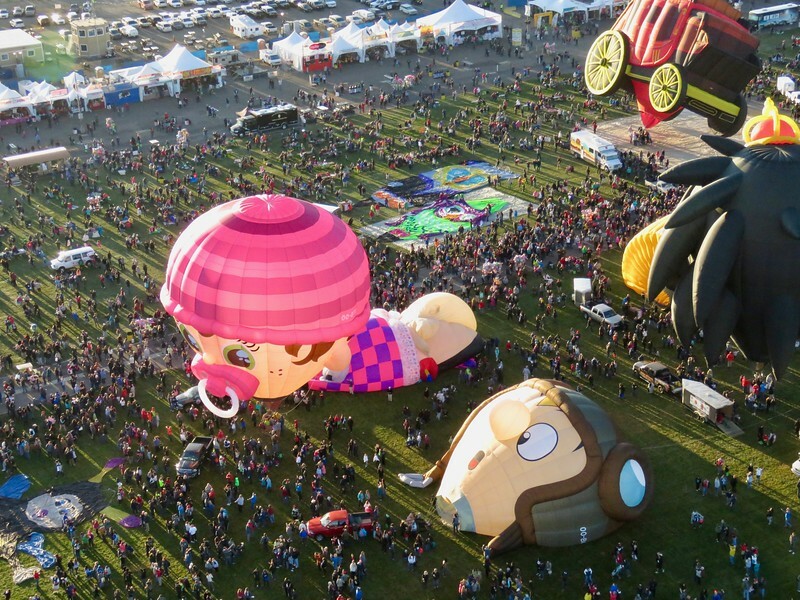 The Balloon Fiesta is easily the most popular event in Albuquerque. The Fiesta runs for 9 days in early October. Each year an estimated 850,000 people come to town to either attend the Fiesta or just watch the balloons from somewhere in the city. Even on the one day we were in town but not attending the Fiesta we walked out of our hotel room to see balloons everywhere. It seemed like every parking lot or field in the northern end of Albuquerque was an impromptu landing zone for some balloonist. We stayed at the Nativo Lodge (check prices) which was only a couple of exits on Interstate 25 south of the Fiesta grounds. It is not quite in the list of the 15 closest hotels. The action starts early, really early in the morning. We arrived at the field at 5am on Thursday, the first of the two days we attended. It only took around 15 minutes to drive from the hotel to the field at that hour via the first Fiesta exit. The second day we attended we started at 5:00 am or so from the hotel, but this was a Saturday when the traffic is even greater. It took us an hour and a half to reach the field. This time we took the second of the Fiesta exits. The first thing that happens, just before dawn, is that the dawn patrol, a handful of balloons, ascends into the sky to “test the box”. 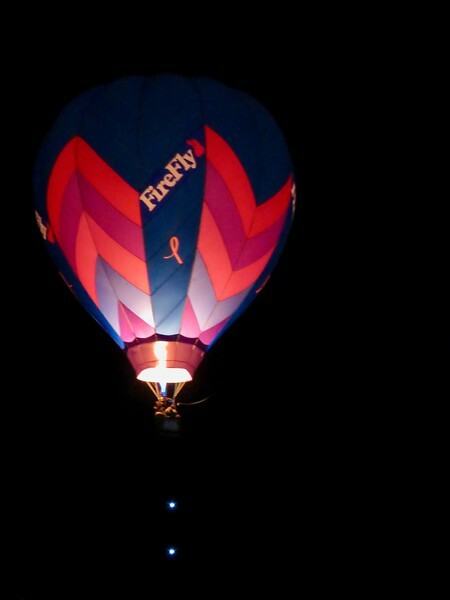 These balloons need to have running lights and they appear dull against the dark sky until they fire their burners which heat up the air in the balloon and provide lift. The burners shoot towers of flame 6-10 feet into the balloon and turn it, in these pre-dawn minutes, into a bright ornament hung in the dark sky. 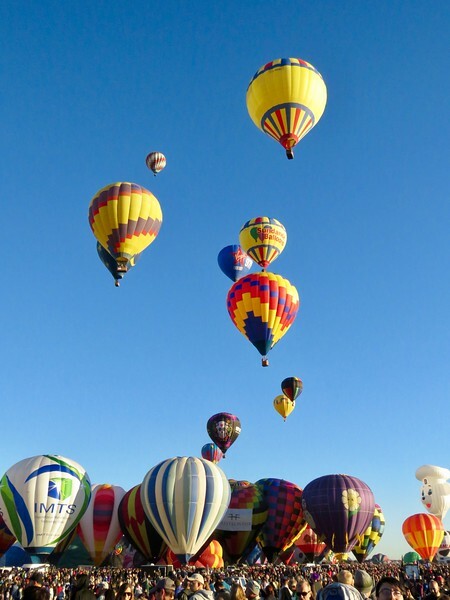 The “box”, that these balloons are testing, is a phenomenon at Albuquerque which makes it an ideal spot for ballooning. On some days, more common in early Fall, there are winds blowing in different directions at different altitudes in the Albuquerque sky. 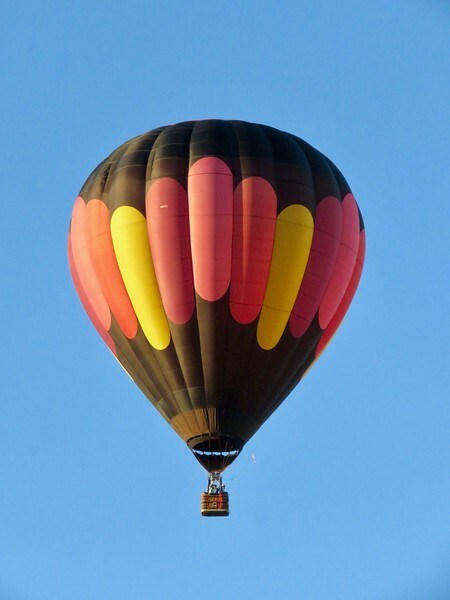 A balloonist can drift towards the city or perhaps rise another 100 feet and ride a breeze in the opposite direction. This allows the balloonists greater control and facilitates some of the competitions that occur on specific dates during the FIesta. 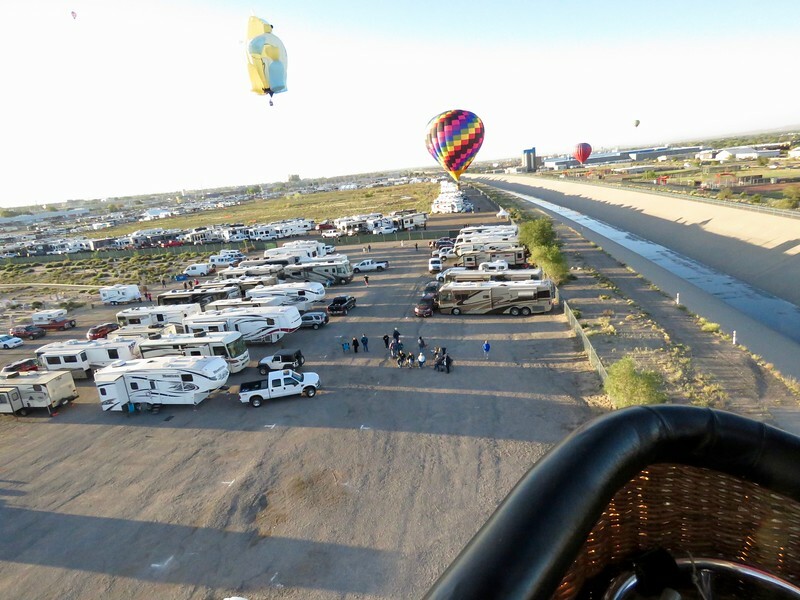 Most people who attend the Albuquerque Balloon Fiesta do not get a chance to go up in a balloon. If you don’t have a company with a balloon, or friends in the Tourism Board the only vendor that can sell balloon rides at the Fiesta is Rainbow Riders. These rides go on sale in January and sell out quickly. The cost is $395 per person. There are a limited number of people who book in January but don’t show up so you can try your luck in the stand-by line if you arrive very early. One of the employees at Rainbow Rider estimated that they take around 8 people a day from the stand-by line. 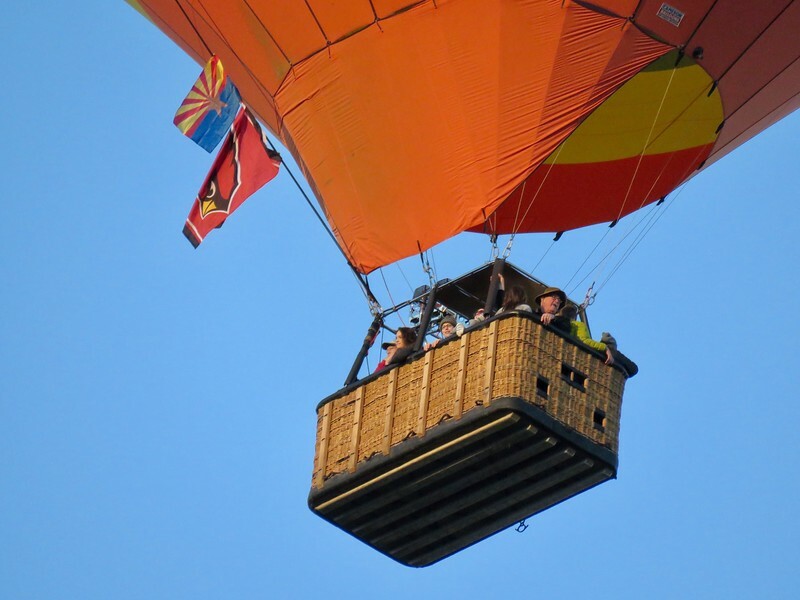 We took a ride in Earth Wind and Fire II which is a balloon owned and piloted by Jon Peterson from Racine Wisconsin. 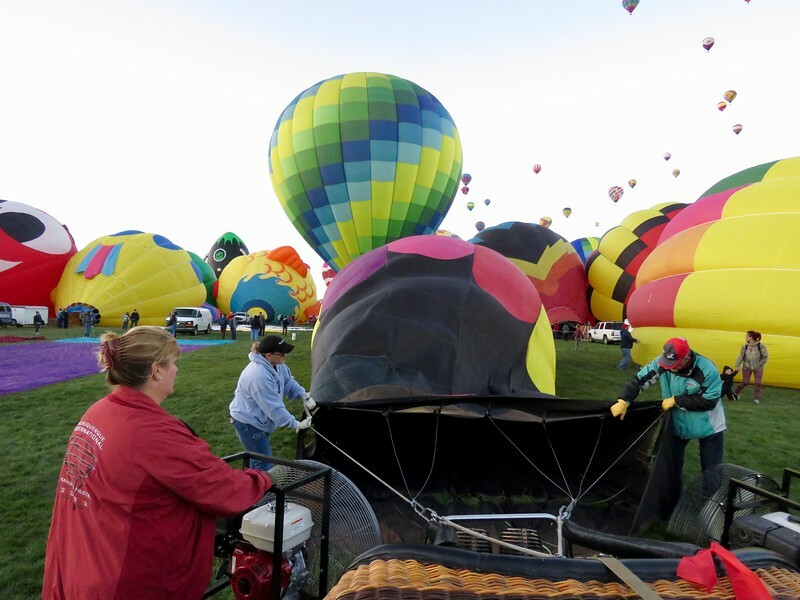 The Fiesta attracts balloonists from a wide area. Earth Wind and Fire II is a larger standard inverted teardrop shaped balloon, a “150”. 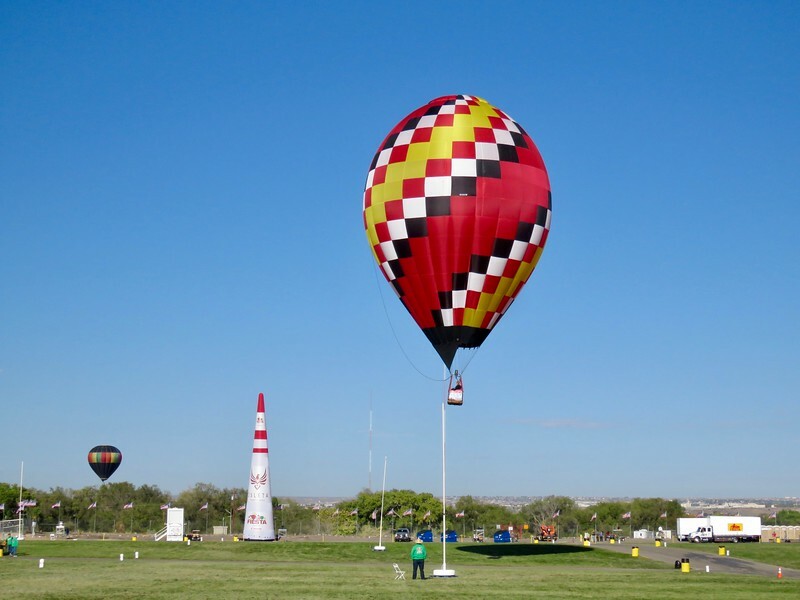 This is to say that fully inflated the balloon holds 150,000 cubic feet of hot air. That much hot air cannot only lift a basket and three adults (Jon, my wife Joan and I) but could also lift Jon’s truck if the lines were not disconnected at the right time. Jon regaled us with stories of times when this had gone wrong for one pilot or another. He derided the abrupt lawn dart landings that some pilots choose to make and promised us something a bit smoother… if the wind would cooperate. He made sure that we knew what we needed to do. With so many balloons in the air we would provide a couple extra sets of eyes to make sure that some rookie pilot was not going to collide with us. We had to keep track of two walkie talkie units that we would use to communicate with the ground crew that would be in pursuit. All of these instructions were delivered while Jon was paying more attention to the preparation of the balloon. 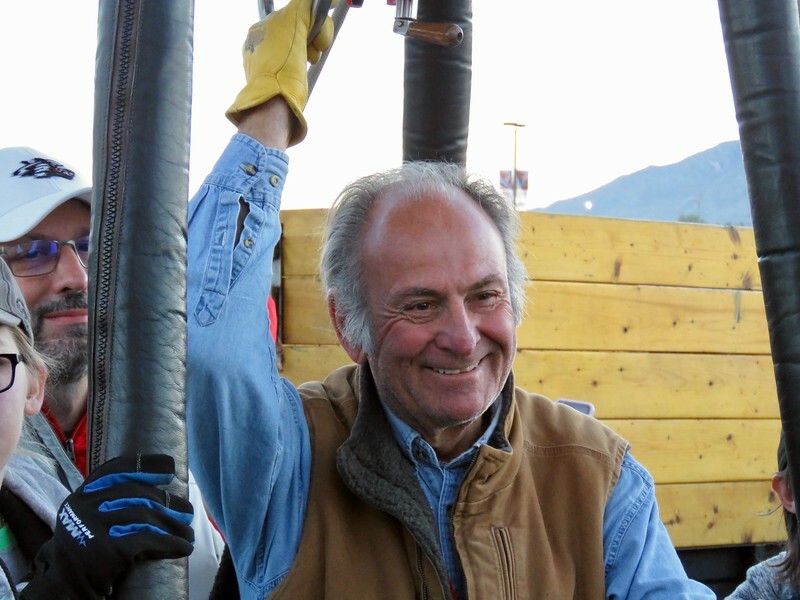 The large balloon was unrolled and attached to the gondola. It was then filled with cold air from two large fans until it was inflated enough to turn on the gas burner which was attached to the top of the basket. With a loud whoosh the flame shot into the inflated balloon. The cold filling of the balloon took a number of minutes but once the flame lit everything started moving very quickly. There are so many balloons at the Fiesta that they are inflated touching each other in row after row upon the field. 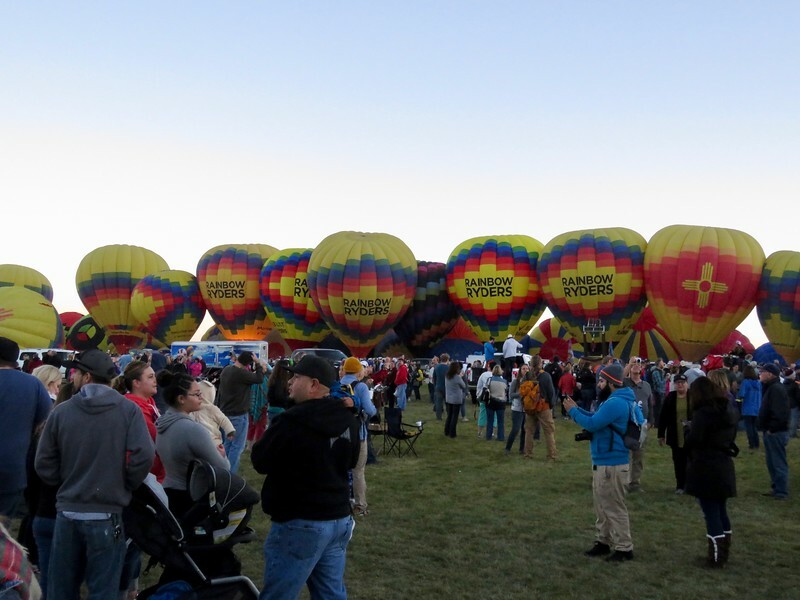 Unlike, we were told, most other balloon festivals, attendees are free to wander around the inflating and rising balloons. To manage the skies an official in a referee uniform coordinated which balloons could take off in what order. We climbed in and quickly were given clearance and away we rose. We rose quickly, caught a breeze and moved rather swiftly away from the field on what Jon promised would be a short flight. When we attended again two days later on Saturday, there was very little breeze and the balloons hung in the sky, with the weather nearly perfect for viewing. Thursday was a special shapes rodeo so a great number of the balloons were special shapes like a frog, alligator, duck, chicken, giant baby, stage coach (Wells Fargo Bank) or cow named Airabelle (Dairyland). After the balloons took off, the field was closed to landings until 10:00am because it was time for the competition to start. 4 large poles were erected on one half of the field now cleared of spectators. Balloonists would maneuver their balloons close enough to one of these poles to drop a ring over the pole. The balloons had to get close to the ground to do this, but if they touched the ground, they would be disqualified. We descended over a culvert and Jon put us down in an area of dirt just behind a couple of baseball diamonds. The balloon slowly descended until it kissed the Earth as Jon had promised… and then the wind grabbed us. Suddenly we were airborne again and Jon announced that this landing would be rougher. It hit and bounced. The third time we hit, the basket tipped over and we dragged along. That was when I learned that you should not try and film a landing on your cell phone as my iPhone bounced of of my hand and out of the balloon (see video). The balloon was still thrashing in the wind. On one side the ragged top of a chain link fence looked like it threatened to rip the balloon and on the other side the balloon was threatening to collide with the baseball outbuildings. Fortunately this was all happening in Albuquerque where balloons fall out of the sky routinely. Two different passers by grabbed a line and directed the top of the balloon to a safe landing. Once the balloon was secured Jon could pop the top of the balloon causing it to quickly deflate. One of our good samaritans had just helped land another balloon. I suppose if you don’t enjoy this kind intervention, it might be a good time to leave town. 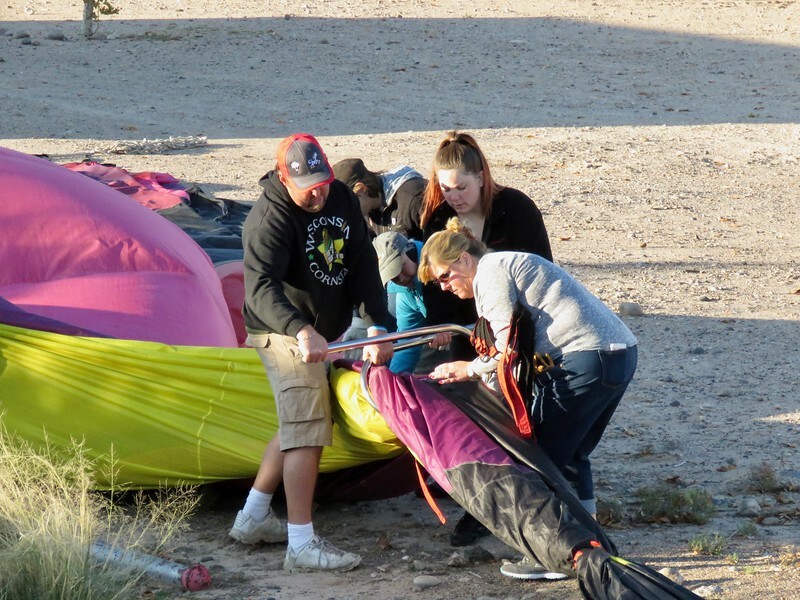 The ground crew showed up and helped pack up the balloon while we talked of more landings and Jon expressed that he was glad he had not had the elderly couple who were to be his original passengers. We returned to the field to watch the end of the competition, including at least one balloonist who managed to place his ring on one of the poles as required. The Fiesta grounds are ringed with 90 concession booths, half of which are selling all kinds of fair food. With the early morning start, the breakfast burrito is a particular favorite (eggs, potatoes, cheese and green chiles). I was told that it was invented here at the Fiesta. You can also buy souvenirs, warm clothes and even balloons (the big hot air kind). Announcers kept up a running commentary about the different balloons and who was piloting what on that morning. There were also bands playing, free samples of various snacks being promoted and a general carnival atmosphere. We attended on two different days, flying only on one of the days. Both days were very enjoyable, even if one was a bigger adrenaline rush. If you can, attend on a weekday. The crowd sizes were noticeably bigger on Saturday than on Thursday. By about 10:00am things wind down and you still have much of the day to see Albuquerque or catch up on your sleep. 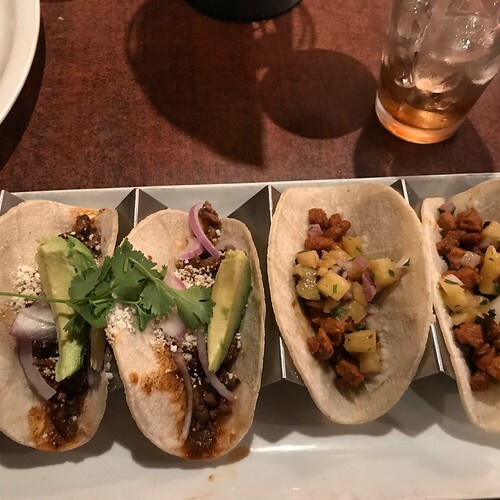 (see 12 Things to Do in Albuquerque, New Mexico and 7 Great Places to Eat in Albuquerque). Balloons don’t tend to fly during the middle of the day because the thermals caused by the heating ground can make flying much more risky. 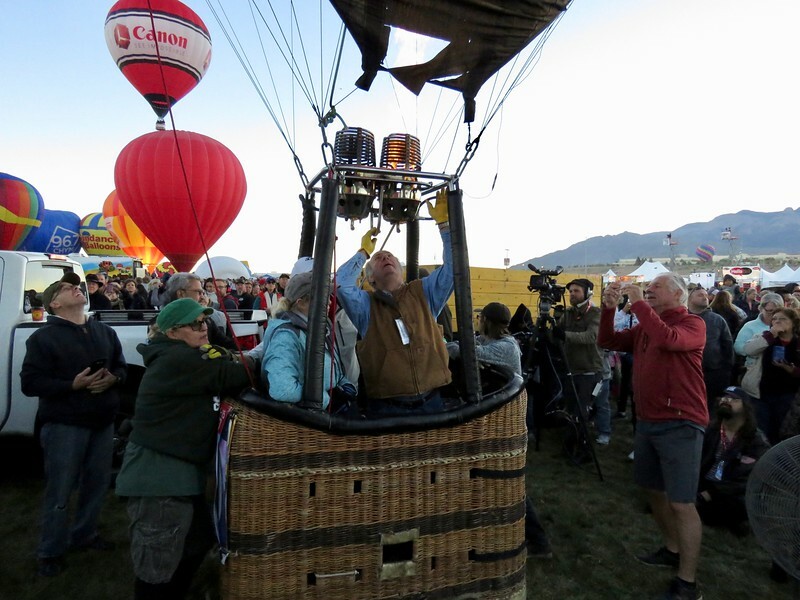 A balloonist caught in a thermal can easily shoot up thousands of feet. 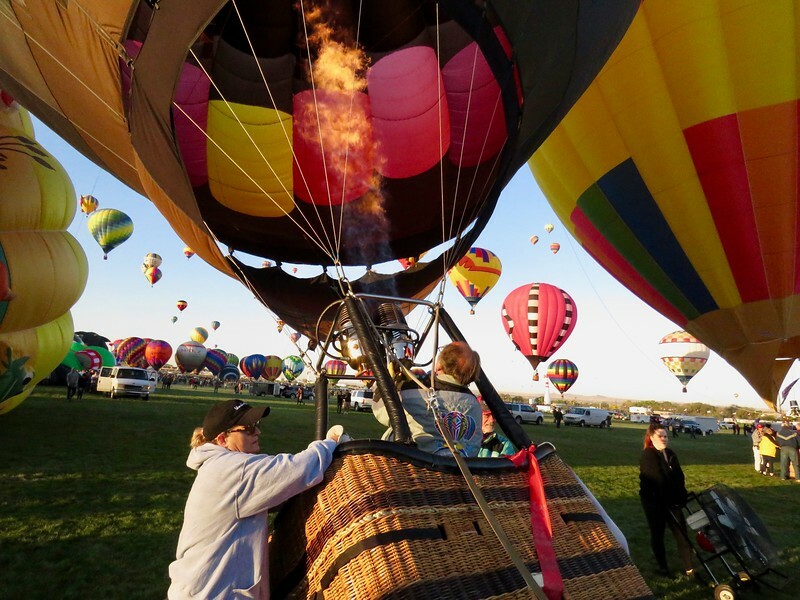 When they pop out of the top the balloon can easily collapse in the cold air, unless the pilot is skillful enough to know to keep his burner lit despite the fact that he is already rising. In the evenings you can return to the festival grounds to see a glowdeo when the balloons inflate and light up but do not ascend. We were usually pretty tired by that time of night. Some local merchants close early the week of the festival as they know these tourists won’t stay up late. 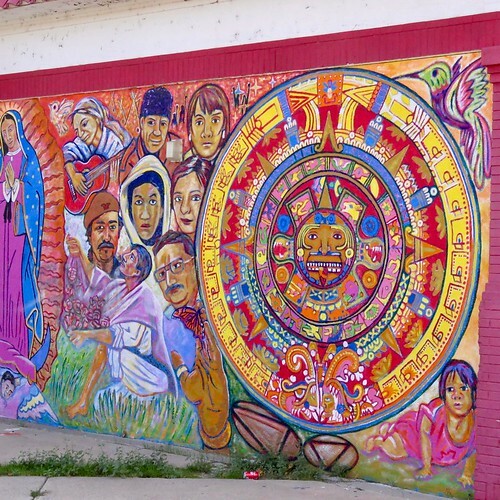 Private Tour: Albuquerque Half Day – This is a private tour for 1-3 people. We can do as much as you like and can fit into 4 hours. I am a pretty laid back and calm person, not known for getting overly excited about different destinations, possibly even a bit jaded by so much travel. The Albuquerque International Balloon Fiesta turned me into a little kid, pointing into the sky and saying profound things like, “looky, looky, looky!”. It was a bucket list event and it did not disappoint. See all my photos from the Albuquerque International Balloon Fiesta.